CD review: "In My Time"
This review first appeared in the May 28, 1993 issue of the North County Blade-Citizen (now North County Times). Yanni's brand of New Age is introspective and poetic  Robert Frost set to music. For those not familiar with the Greek star, he plays piano in both solo and small combo settings. His playing is similar to that of Liz Story: meandering, with the ambience of a lazy Saturday afternoon somewhere off the beaten path. 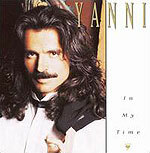 If there's a complaint about his latest album, it's that it does get a bit monotonous; Yanni doesn't do much to mix things up. An uptempo beat here and there wouldn't hurt the flow at all, and would serve to bring the listener's attention back to his playing. But Yanni's legions of fans are unlikely to share that sentiment, and his piano playing is admittedly gorgeous.